Alas, Ms. Miller, "you are wrong because you know neither the Scriptures nor the power of God," those pesky "literalists" might retort. 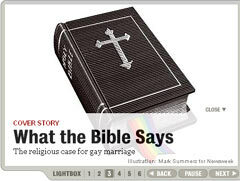 At any rate it appears Ms. Miller is insistent on eisegeting holy writ to declare ex cathedra from her perch at Newsweek that the Bible can be used to defend gay marriage. Indeed, the Bible is clear in numerous passages that human sexuality has been plagued by sexual sin, lust, betrayal, and adultery since sin entered the world in the Garden of Eden. Yet Miller fires her first shot by holding up biblical patriarchs as though they are the Christian model for marriage, not flawed sinners in need of a savior. Of course, it is just as likely that Ms. Miller understands that's the Christian view of marriage, and thinks anyone who believes that cannot possibly be modern or sensible, which illustrates more about her prejudices than those of the alleged religious bigots she claims to trump with her knowledge of Scripture.